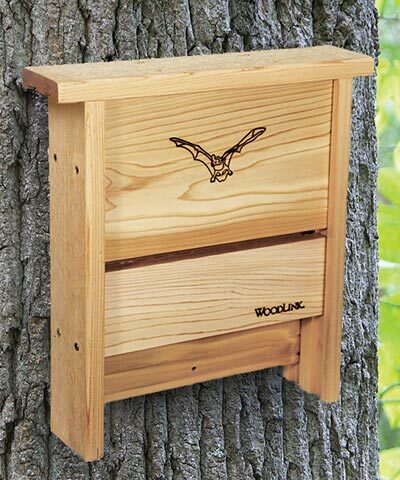 Help bats thrive by offering them a roost in the Woodlink Bat Shelter. This house is perfect for beginning bat landlords, or as an addition to an existing colony. The 0.75" deep, single chamber can accommodate up to 20 bats, and the lapped interior helps the bats cling to the wood. A 0.5" wide slot on the front of the item aids bats in locating the home when time to return, and also offers ventilation. The flat roof overhangs the home to prevent rain from entering, and an image of a bat in flight on the front of the piece completes the unit. The cedar body maintains a natural theme, while the two included screws enable the house to be mounted on a wall or pole. Begin or expand your bat colony easily using this Bat Shelter. Made in the USA.